You have to give her credit for managing to put on some clothes. I doubt it was an easy task, and probably took at least three Secret Service agents to convince her it was necessary. Next : " just one thin little mint "
New fashion statement: Frump Sheik.
" at least three Secret Service agents..."
I hope they got triple hazardous duty double danger pay with a hideous eye burning ugly bonus. 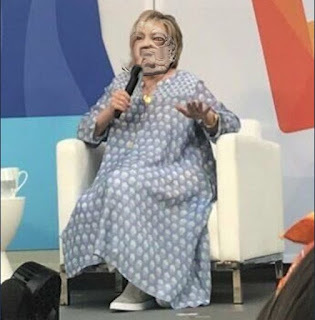 This fashion statement is Hillary's attempt at being human - and it says a lot about how she sees "the little people" whose votes she so desperately needs to complete her evil plan. I am, however, enjoying her constant suffering until the day she dies and realizes neither did she get that Queen of Hell position for which she sold her soul.